Four people were arrested and over 50 vehicles were inspected during a multi-agency operation, targeting light goods vehicles (LGVs) and passenger carrying vehicles (PCVs) in Suffolk last week. Operation Truck and Bus took place over five days last week, between Monday 18 and Friday 22 February. 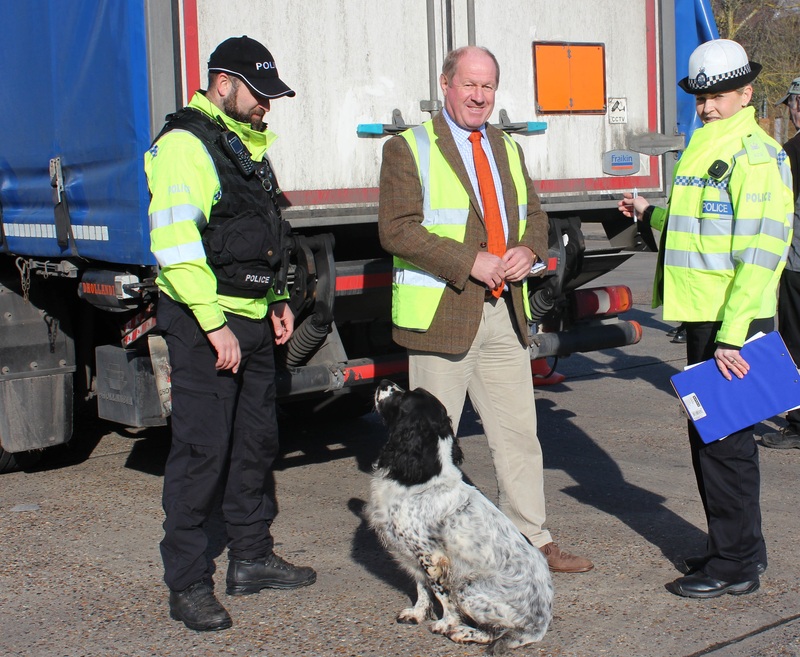 The first four days involved enforcement taking place across the county and the on the fifth day, vehicles were brought back to a check site at the Tesco Truck Stop in Copdock. The aim of the operation was to disrupt, deter and detect offences relating to all forms of vehicle-enabled criminality, with a primary focus on commercial vehicles, but also larger vehicles transporting shipping containers. This was carried-out in support of both a Europe-wide TISPOL Truck and Bus campaign, and a National Police Chiefs’ Council Carriage of Dangerous Goods campaign. It also aimed to improve compliance with road safety legislation – particularly amongst commercial vehicles – through observance of tachograph and driver hours’ regulations, and by removing unsafe vehicles from the road. During the first four days Roads and Armed Policing Team (RAPT) officers deployed to strategic routes around the county - primarily the A14, A12 and A11 - with the intention of identifying and stopping vehicles suspected of any offences. On the fifth day, RAPT officers were joined by the Road Casualty Reduction Team (RCRT), in escorting vehicles back to the check site at Copdock, where they were assisted in carrying-out checks by the Police Dog Unit, and partners from the Driver and Vehicle Standards Agency (DVSA) and HM Revenue and Customs (HMRC). 59 vehicles in total were stopped across the five days, of which 37 were escorted back to the check site, with just six leaving clear of any offences. 11 of those vehicles were LGVs or buses, seven of which recorded tachograph offences and two had carriage of dangerous goods offences for insecure loads. Only two were clear of any offences. 22 vehicles were stopped during the first four days of action, with only one found clear of any offences. Sergeant Julian Ditcham, from the Roads and Armed Policing Team, said: “This was a positive week of action, the primary aim of which was to continue to make our roads safe for all users. “As such, it was very disappointing that 52 of the 59 vehicles stopped over the course of the week recorded offences and that four people were arrested for drug-driving, but this displays the value of these types of operation as far too many people are prepared to take unnecessary risks on our roads. Tim Passmore, Police and Crime Commissioner for Suffolk, said: “Keeping Suffolk's roads safe and free flowing is particularly important for residents and businesses. The Roads and Armed Policing Team has a pivotal role in helping to achieve this and I really would like to congratulate them and the other agencies who contributed to make Op Truck and Bus such a success. “I spent some time at Copdock during the operation and was very disappointed to see that such a high percentage of vehicles pulled over recorded offences and absolutely shocked to see two drivers arrested for drug-driving in the short time that I was there. Four people arrested on suspicion of drug driving: one provided a positive drug wipe for cocaine and the other three for cannabis. 26 Traffic Offence Reports (TORs) were issued: six for illegal number plates; three for not wearing a seatbelt; two for no MOT; two for driving through a red light; two for an overweight vehicle (£300 fine); two Graduated fixed penalty notices for tachograph offences, totalling £400; and one each for: careless driving; no insurance; no driving licence; defective tyres; defective exhaust; defective brakes; excess daily drive (tachograph); and one for not having a tachograph fitted. HMRC challenged 23 vehicles checking for illegal fuel and no offences were found. Their officers also interviewed eight people in respect of the Hidden Economy, one of which was registered correctly and the other seven requiring follow-up enquires.